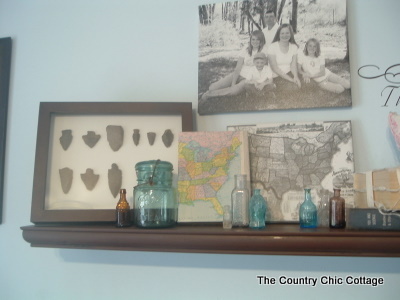 You are here: Home » decor tips » Summer Mantle Shelf with Maps! Summer Mantle Shelf with Maps! My mini bottle collection remains on the shelf. Even filling my Ikea lantern..
And what mantle doesn’t need a blue ball jar?? 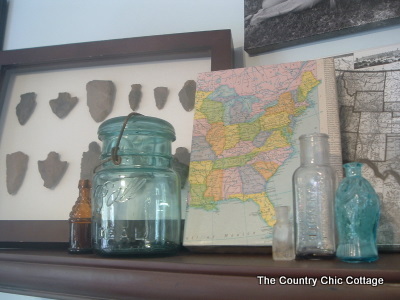 The colorful map, jars, and bottle add just the right amount of summer fun! So am I the only one that constantly changes things?? next post: Flat Stanley Adventures for Summer Geography Fun! 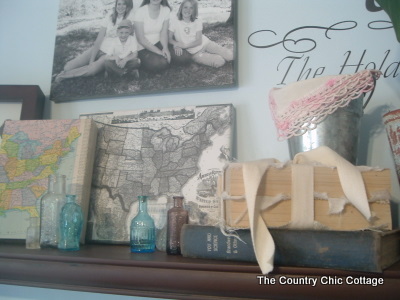 This mantle is a great idea. I think it would look great in a study…I have a study/den/computer room. Your mantle turned out beautiful! I also love your canvas map idea! This is really great! 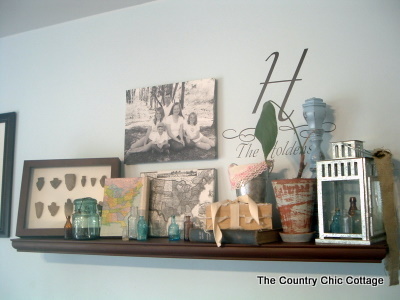 I have a great mantle that I struggle with decorating, especially since I have a painting by my mom that hangs there permanently. 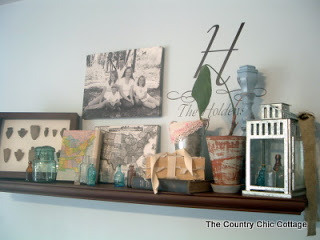 Love this idea, might have to try something like this! If I do I’ll share pics! Oh, that is nice! 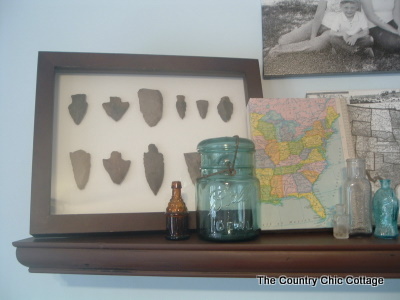 Love your arrowhead collection. cute! i like your maps! that’s a great idea! this is adorable and fun! You’re like me…I constantly change and rearrange my decor items because I’m making new things…or simply for the season! I will follow your blog. Come by sometime! Love the maps are great. I have that same Ikea lantern on my mantel. 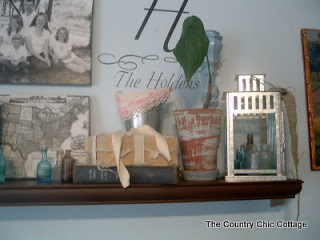 And “NO” you are not the only one who changes up their mantel constantly. Love the addition of the maps and I especially love your mini jar collection. 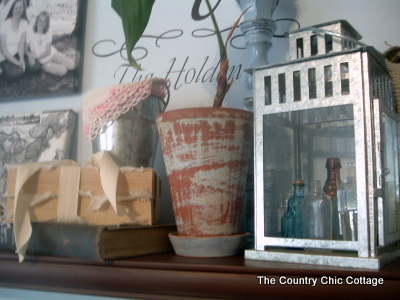 I have a few of those mini jars in browns and blues…you have just inspired me to get these things out of my cabinet and put them to use! Hi Angie! Your new mantel display looks wonderful. I especially like the maps. Thank you for linking up to my party. Love your blog. Doing the 31 day challenge and found you on the forum.